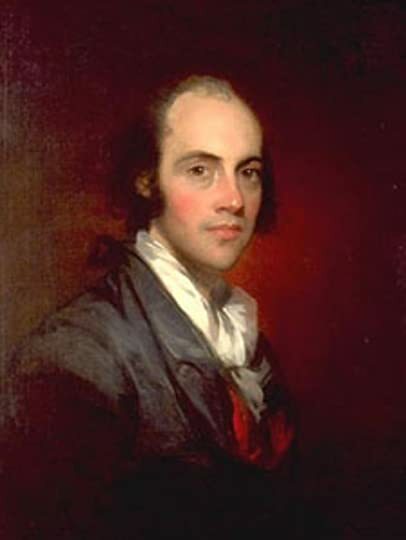 Aaron Burr is, without a doubt, one of the most fascinating figures in American history. He cuts his own swath, leaving a wake behind him that rocks the tender foundations of this newly minted country. He is honorable and dishonorable in equal measure. He is a highly skilled lawyer (he will need those skills to defend himself) and an accomplished politician. Today, he is not as well known as Benedict Arnold, but in a series of events that are more lurid than the plot of a dime novel, he nearly supersedes Arnold as the most loathed man in America. It is hard to believe that this controversial figure was nearly the third President of the United States. In 1800, one of those pivotal years in politics, Burr makes a deal with Thomas Jefferson to allow him to be president if he insures that Burr will be made vice president. Burr can bring the key New York votes to Jefferson. Interestingly enough, in the first ballot, they tie 73-73. With the way we venerate Jefferson (with a few reservations about his association with Sally Hemings), it is interesting to think about how close he comes to NOT being the third President of the United States. Really only because Burr upheld his promise, one of those times when Burr was maybe too honorable, did Jefferson achieve his ambition (though he insists in true Cincinnatus style that he never desired the Presidency). Or how about a description of an older Jefferson after two terms in the presidency. Ahh, yes, Mr. Vidal, you can most definitely write. A true gentleman, and yet; somehow still a cad!!! 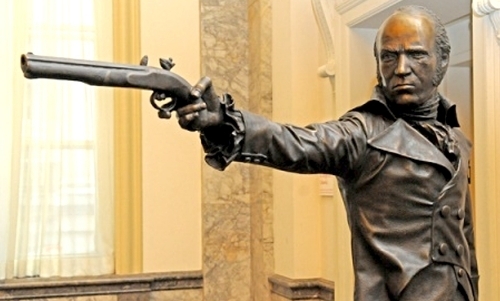 I love this badass statue of Aaron Burr at the Museum of American Finance. Vidal explores his growing conflict with Alexander Hamilton, which escalates under the spidery web of insinuations that Jefferson glibly whispers in the ears of those around him. Burr is defined by this brief moment in time, involving two pistol shots, leaving one mortally wounded and immortalized and the other disreputed and, in many measures, driven to more desperate acts when he finds himself on the run out West. Those actions lead to the term “treason” being associated with him, but really it is more about making him pay for the death of Hamilton. Vidal also explores the spurious comments that were made about President Martin Van Buren’s parentage. Politics have certainly reached a new low with our most recent election, but have no delusions; there was mud slinging, eye gouging, malicious slander, ankle biting, and generally unseemly behavior from the very beginning of our country. 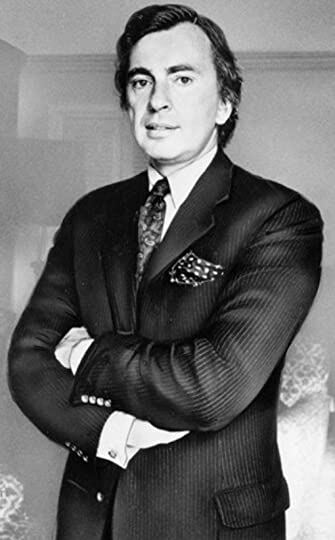 Gore Vidal looking very dapper in 1972. Vidal takes us behind the scenes and shows us a more tarnished view of the Founding Fathers. At times this book is irreverent, but under the guise of Burr’s memories, one does wonder if this isn’t closer to the truth than the idealized version of history we are spoon fed with the American flag draped over our shoulders and the Statue of Liberty sitting rather provocatively in our laps. I chuckled. I giggled. I gasped. The book is serious though. I don’t want to leave people with the impression that it is farcical or a spoof. Vidal does his research. He considered adding the long list of sources that he read and consulted to write this book for he wanted to stay out of the range of the rabid politicos who would not necessarily appreciate his interpretations of history. He elected to let them say what they will in true Aaron Burr fashion. Highly Recommended to those that want to experience an alternative view of our venerated Founders.